Pakistan's former Prime Minister Benazir Bhutto is expected to seal a reconciliation deal with President Pervez Musharraf. The deal would take some of the pressure off Gen Musharraf ahead of a presidential election on Saturday. He still faces last-minute challenges to his candidacy in the Supreme Court, which could delay the vote. Ms Bhutto plans to return to Pakistan from self-exile on 18 October to fight general elections due by mid-January. The agreement cancels corruption charges against Benazir Bhutto and other politicians in the name of national reconciliation, says the BBC's Barbara Plett, in Islamabad. Ms Bhutto has now dropped her threat to join the rest of the opposition in a parliamentary walk-out aimed at discrediting Saturday's presidential poll. Opponents say it is unconstitutional for a military officer to be elected president. They are challenging Gen Musharraf's candidacy in the Supreme Court for a second time, and the court is due to rule about whether to postpone the vote. 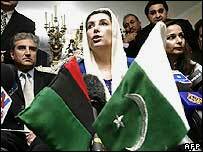 If the verdict favours Gen Musharraf, he is expected to formalise the reconciliation deal with Ms Bhutto. This would pave the way for Ms Bhutto to return to Pakistan for forthcoming general elections. If her Pakistan People's Party (PPP) does well, she could end up sharing power with Gen Musharraf, our correspondent says.